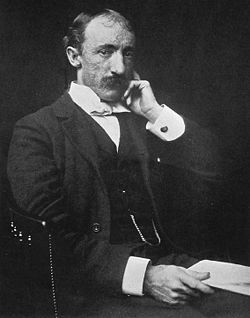 Frank Hamilton Cushing (July 22, 1857 – April 10, 1900) was an American anthropologist famous for his study of Zuni Indian culture. Cushing was an expert on the process of making various Native American artifacts and a pioneer in anthropological study of a culture by living among its people. He also pioneered cultural relativism and the cross-cultural method in anthropology. Cushing's work provided unique insights into the lives of the people he studied, as he became part of their society, sharing details of his own life in his culture with them. This way of exchanging stories, beliefs, and experiences offers a model of cultural exchange that allow people of all cultures to learn from each other, breaking barriers and becoming one human family. Frank Hamilton Cushing was born on July 22, 1857 in the town of Northeast, Pennsylvania. His family moved in 1870 to Medina, New York. As a boy Cushing took an interest in Native American artifacts and taught himself how to knap flint, making arrowheads and similar handwork. Some of the artifacts he could produce were indistinguishable from the originals made in prehistoric times. This accomplishment attracted attention from ethnographers and Cushing was asked to write a paper on his handwork. He published his first scientific paper when he was only 17. After a brief period at Cornell University at age 19, he was appointed by the director of the Smithsonian Institution the curator of the ethnological department of the National Museum in Washington, D.C. There he came to the attention of John Wesley Powell of the Bureau of American Ethnology. In 1879 Powell invited Cushing to join an anthropological expedition to New Mexico. The group traveled by train to the end of the line at Las Vegas, New Mexico, then on to a Zuni Pueblo village. Cushing decided to stay among Zunis, living with them for a total of five years (from 1879 to 1884). He was the first ethnographer who lived among Zunis. After some initial difficulties (the Zuni seriously considered killing him as he was obviously after their secrets) he was accepted by the community and participated fully in Zuni activities, becoming in 1881 a member of the Priesthood of the Bow. He received the Zuni name Tenatsali ("medicine flower"). In 1882 he took some Zuni on a tour of the United States, which attracted considerable media attention. During this tour he married Emily Tennison of Washington, D.C. in 1882. He returned to the Zuni, but was plagued by illness and political difficulties (he sided with Zuni in a land dispute), and was recalled to Washington in 1884. He was able to return briefly in 1886, but again had health problems. He was succeeded as leader of the Hemenway Southwestern Archaeological Expedition by archaeologist and ethnologist J. Walter Fewkes. Cushing also worked at Key Marco in Florida in the mid-1890s and in abandoned villages in the American West. He came into contact with Stewart Culin on the World's Columbian Exposition, with whom he began to write about the history of games. Cushing died on April 10, 1900, after he choked to death on a fishbone, while on a research project in Maine. He was only 43 years old. Cushing’s approach to ethnographic study was ahead of his time. He believed that field study is essential in ethnographic work, in the time when most of the ethnography was still based on philosophical speculation. His work among Zuni was important not only from the perspective of understanding the Zuni culture, but also as one of the first fieldworks ever performed by an anthropologist who actually lived among the people he studied. Cushing spent five years among Zunis. He gradually became part of the tribe, even achieving some significant recognition from the fellow tribesmen. He studied their daily lives, material culture, and was able to obtain insight into their secret religious ceremonies. However, Cushing did not only observe Zuni culture—he participated in it. He was not a cold observer, detached from the object of his studies—Cushing was totally immerged in Zuni culture. He shared with them the stories and myths from his own culture. In return, the Zunis were more eager to tell him their own folk tales. He also took some Zuni with him on a tour to show them American culture. Through his comparative approach to cultural studies, Cushing discovered cultural relativism, which later became consistent part of anthropology as an independent discipline. He believed that all peoples drew upon their own culture—its history, stories, and religious practices and beliefs—and through that interpreted the world around them. He did not regard Western culture “higher” or “more developed” than Indian culture, but compared both cultures in equal terms. He thus spoke of “cultures,” in the plural. That was rather novel approach, making Cushing a forerunner of cross-cultural method in anthropology. Cushing did significant archaeological research in Florida in the 1890s, but the manuscript with his observations was lost after his death. It was only in the early 2000s that it was rediscovered, having been buried in the archives of the Smithsonian Institution in Washington D.C. The manuscript is rich with archeological data of Southwest Florida that has long been forgotten. Cushing's records were detailed and comprehensive. For example, he described the usage of the sinkhole system and underground aquifer by locals, of which no previous record existed. Cushing also attempted to connect prehistoric civilizations of Florida, the American Southwest, Mexico, the Yucatan, and the Mississippi valley into one bigger cultural subgroup, which was a rather novel approach in cultural studies of this area. Cushing was an innovator in the development of the anthropological view that all people have a culture that they draw from. His approach to anthropology in which he compared two cultures (in his case Western and Zuni Indian) puts him as the first American anthropologist to interpret cultures from a cross-cultural ethnographic perspective. He was also ahead of his time as the first participant observer who entered into and participated in another culture rather than studying and commenting on it from his office. Cushing was also the first anthropologist to use the term “chiefdom,” referring to a prehistoric aboriginal form of social organization. The term reemerged again in 1970s, and was developed later by Robert L. Carneiro. Cushing, Frank H. 1965. The nation of the willows. Northland Press. McGee, W. J.; W. H. Holmes, J. W. Powell, A. C. Fletcher, W. Matthews, S. Culin and J. D. McGuire. 1900. “In memoriam: Frank Hamilton Cushing.” American Anthropologist 2 (2): 354-380. PBS. 2001. New Perspectives on the West: Frank Hamilton Cushing. Retrieved December 21, 2006. Perdichizzi, Betsy. “Cushing's lost Florida manuscript.” Marco Island Sun Times (September 21, 2005). Retrieved December 21, 2006. Preston, Douglas. 1993. “Frank Hamilton Cushing.” New Mexico Magazine. History of "Frank Hamilton Cushing"
This page was last modified on 26 April 2017, at 15:20.